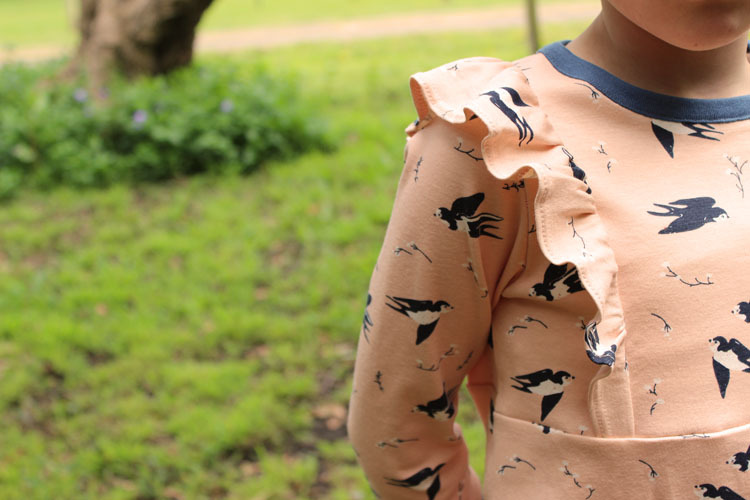 Today I am sharing the original design of the Little Betty (now the Issie top), that I first designed over three years ago! As you may have read in my previous post, I wanted to update the pattern to include more sizes and options. This top includes the double ruffled and pieced top with deep cuffs and waistband. I love how this one turned out and who can say now to a creamy pink jersey print??? This lovely combed jersey was designed by Jenny Rosen for Birch fabrics, which I purchased at my local Spotlight. I love that Spotlight now carry a great range of designer fabrics like Birch, Cloud 9, Denyse Schmidt. I paired it with some teale/blue cotton rib. 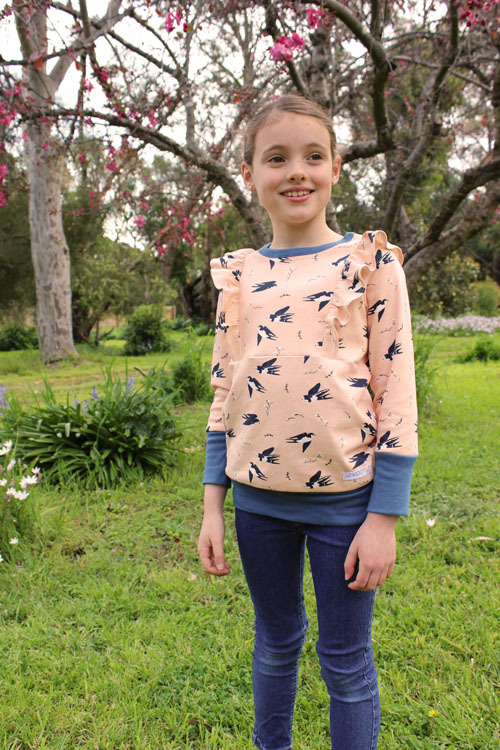 The Issie top is designed to be sewn in stretch fabrics. I recommend combed jersey and sweatshirt fabrics for best effect. The ruffle/s can be made in stretch or woven fabrics. The optional cuffs are best suited to lightweight ribbing (double ribbing not recommended - as I found out the hard way! - too heavy). Isabella is so obliging when I ask for photos! She gives me a nice mix of smiley/pensive/explorative looks! So would you like to see all the options offered in the Issie top pattern? You can see the line drawings below. 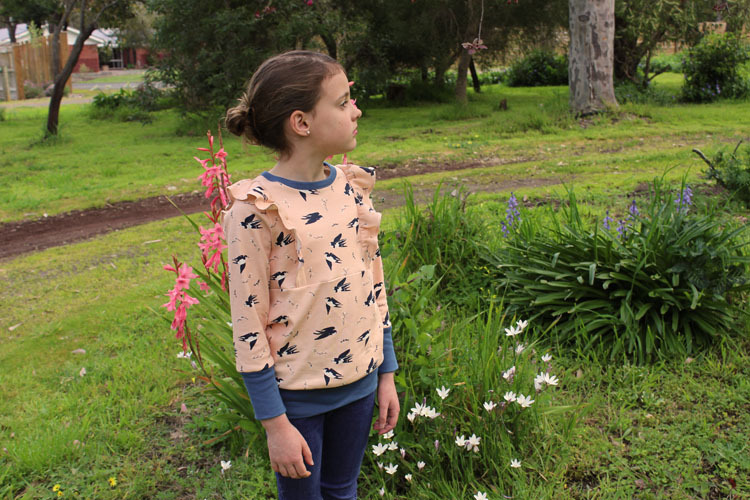 So, now I am looking for some testers to sew up the Issie top! I am looking for around 15-20 testers to sew up the various options and give feedback (including fit photos). Testing will begin on Sunday (tomorrow) evening Melbourne time and will finish next Saturday 14th October, with a release date set for Monday 16th October. Please see the size chart below before applying. Successful applicants will be notified by email on Sunday 8th (Melbourne evening time) and invited to a private Facebook group to obtain files, share photos and feedback. You can apply to test the Issie top pattern HERE. Applications are now closed. Thanks for your interest and I can't wait to get started! That looks stunning!Both my daughters need this in their wardrobe! Oh <3 To bad my daughter doesn't fit in the chart anymore! Good luck with testing! So beautiful. I love those ruffles! Wow so pretty! I really love it! yep, I am in love!